Centaur Rising prides ourselves on our excellent school horses. We are often asked, “Where do you buy your school horses?” The truth of the matter is that we believe school horses cannot be purchased. It takes a long time for the horse to develop trust in the handler and the handler to develop trust in the horse. It takes even longer for this trust to extend to a new and unfamiliar rider. Our school horses are CR’s missions “personified”! Centaur Rising greatly values our school horses. Every effort is made to insure that the horses are happy in their work and in their surroundings. All of our horses are turned out for the duration of the day that they are not in contact with people. Horses’ expressions are constantly monitored to make sure that they are happy with their work and with their riders. This helps to maximize safety. It also insures that horses continue to happily participate for a long period of time. Our beloved school horses are pictured and described below. 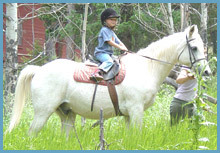 Our mission would be impossible without our donors’ generous sponsorship of our school horses. Dakota is a twenty-something Morab. He is on loan to us from Suzanne Stevenson. Dakota is trained to second level. He can teach people shoulder in, haunches in and half pass. He is a very pretty addition to Centaur Rising. Dune is a middle-aged purebred Arabian. He was rescued from a corral from which a mountain lion dragged his five goat companions away. Dune has wonderful gaits, is petite and very pretty. Marley, whose registered name is "Antioch", was donated to Centaur Rising by Page Strieter. He is a 2000 registered Hanoverian gelding that was used as a jumper in his earlier years. 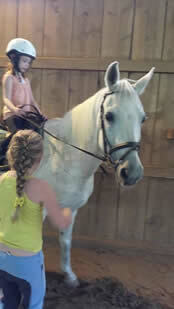 Although an impressive big mover, Marley is also very gentle and kind. 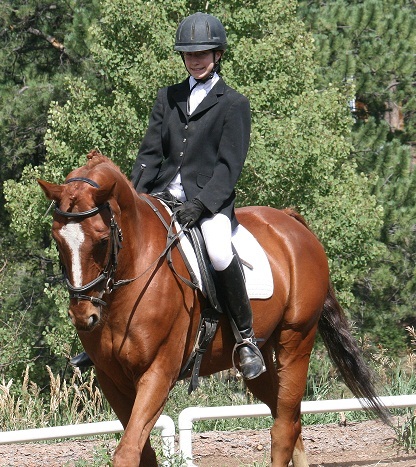 He is suitable for beginners, yet has won a high-point award in our home-hosted Rocky Mountain Dressage Society shows. Rainbow, registered name Annie's Darq Side, was donated to Centaur Rising by Christy Cragin. Rainbow has a record of extensive wins in Arabian sporthorse classes. 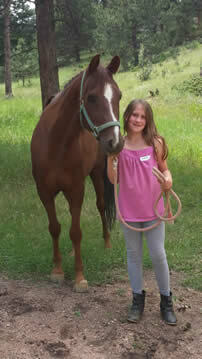 He is a 1998 purebred Arabian gelding. Sabre, registered name GG Sabre TW, is a 2000 purebred Arabian gelding. He was Arabian Horse Association Region VIII Training Level Dressage Champion in 2006 as well as many times Arabian Hunter Pleasure Champion at recognized AHA shows. Sabre was generously donated to Centaur Rising by Lisa and Lindsay Dolan. Sabre has since proven to be a reliable mount for beginners. He is being trained at second level. Shade is a 1996 draft cross mare who has been associated with the founder since Shade was a yearling. Totally trained by our students, Shade has been successfully shown to second level dressage. Shade is appropriate for intermediate to advanced students. She can teach counter canter and half pass. Like all of our school horses, Shade rewards the student who is able to make the correct use of his/her aids to produce more “throughness”. This results in more elegant gaits and longer strides. Please help us keep Shade to teach students these things. A successful stable must have role models and goals to which students might aspire. 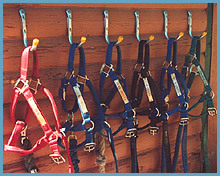 The following horses help to provide this very important role. “Aldeberon” is the name of a star, the eye of the bull in the constellation, Taurus. “Al”, a son of Alabaster, came to the US from Germany in 2003. He ended that year ranked by USDF as second in the nation at training level for the Westfalen breed and third place at training level Jr/YR in the RMDS Horse of the Year that year. Al is being trained at second level. He can be used for seat lessons for one wishing to learn to sit the warmblood gaits. Donntano, also from Germany, was the 2004 RMDS Horse of the Year at training level with a Junior Young Rider. He won the RMDS high point Oldenburg award and was first in the nation for his breed at training level Jr/YR. He repeated the USDF honor in 2005 at first level and was named RMDS Reserve Champion at first level, Jr/YR. Donntano is a son of the “dressage sire of the century”, Donnerhall, and out of a Brentano II mare. Donntano’s mother’s half sister, Brentina, is considered the “best dressage horse in the history of the USA”. She took the gold medal in the 2002 World Equestrian Games, bronze at the 2005 World Cup and was fourth in dressage at the 2004 Olympics in Athens. 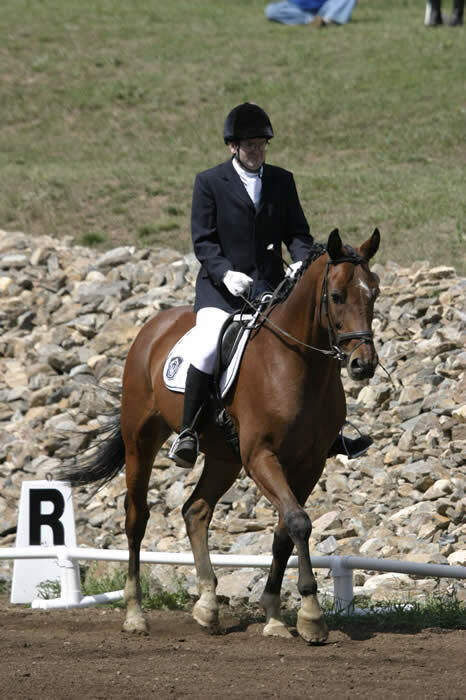 Donntano is available to advanced riders who wish to experience a world-class dressage horse. Sponsorship will help assure his long-term training, advancement and promotion – thus bringing further credibility and visibility to Centaur Rising. Donntano was shown at second level in 2006. He is trained to most of the movements at third level. Weltmann, “Wally”, came to the US from Germany as a four-year-old in 2003. He is a son of the big moving Weltmeyer, the leading Hanoverian dressage sire in the world. Although possessing big gaits himself, Wally at 15’3” is small and extremely gentle and "laid back" for a warmblood. Wally has earned scores as high as 69% at second level and is training third level. Wally has, nonetheless, helped out with Horse Camp by taking little kids on their first trail ride and teaching kids to post the trot. Wally is a priceless asset to our program. Your sponsorship will help us to further his training such that he can gently teach beginner to advanced skills to students for many years to come. Several school horses from Centaur Rising's early years have since sadly departed from this world. These horses taught countless students so many things. A special scholarship fund has been established to honor them. If you would like to contribute, please go to "Donate Now". Let us know that you want your donation to be made in the memory of one of these wonderful teachers. Bonnie, "Reluctant Review", was a 1988 thoroughbred mare. She was generously donated to our program by Meagan Quigley. Bonnie proved to be an indispensible teacher - calm and dependable for beginners, yet impressive when ridden by more intermediate riders. She was the special horse that can be counted on to take a rider into the dressage show arena for the very first time. Bonnie was euthanized on May 18, 2013, when her arthritic knees could no longer safely carry her. We miss Bonnie every day. Looking Dapper was generously on loan to us from Valerie Ritterbusch. He was a 1980 Appaloosa gelding. He had been shown in three-day eventing and dressage. He fast became a favorite at Centaur Rising. 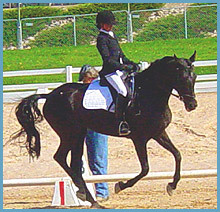 CMF Kaseem, show name “Amsel”, achieved national prominence as a training level dressage horse. He was ranked fourth in the nation by USDF at training level open as a Half Arabian in 2004. He was 6th place in Horse of the Year in the Rocky Mountain Dressage Society (RMDS) Jr/YR at training level that year. “Seemo” was a great school horse for intermediate riders teaching them about the proper connection from the leg and seat to the hand. The student’s efforts were amply rewarded by the improved gaits and elegance, which are demonstrated when “Seemo” is properly ridden. Kaseem also knew some advanced dressage work – half pass and flying changes. Wheras it was the founder who started Kaseem under saddle, subsequent training has been the responsibility of individual students. Kaseem was foaled in 1996. He passed away on October 30, 2013, after a neurological incident (a brain tumor or stroke). LA Star Duster was one of the icons of CR. “Starsky” came to live with the founder in 1989 as a four-year-old. He was shown to local and regional honors in National Show Horse competition in halter (undefeated! ), English pleasure, western pleasure and driving. Starsky conquered most of the first 170 miles of the Colorado Trail. He was the first choice for the first lesson for both tiny kids and adults. 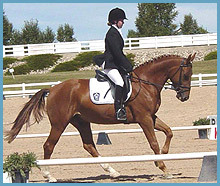 Star Duster was an acceptable training level dressage horse, easily teaching the proper connection between legs, seat and hand. Please help us recognize this tireless helper! Kona, “Winner Impressor” to the American Quarter Horse world, was a 1981 gelding that was under the founder's care since 1994. Kona’s early training did not acknowledge his sensitivity. It took many years as a school horse for Kona to learn to regard humans as friendly and non-threatening. 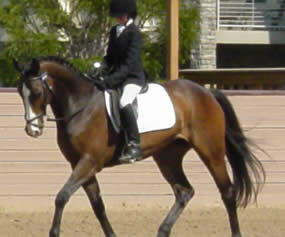 Kona was a great trail horse and was shown at training level dressage. He was beloved by adults and youth alike. Kona passed away in 2008 at the age of 27 after living with us for 14 years. Kona died of cancer. NT El Moracco was trained by the founder's daughter, Alyssa. Moracco was shown successfully in Arabian western pleasure, English pleasure and hunter pleasure classes. Katryna Evans leased him when she was ten. 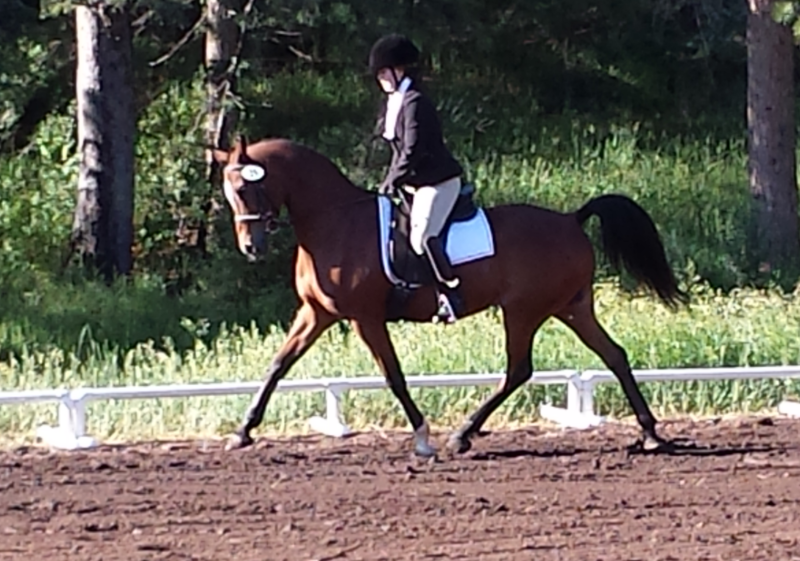 It was “Rocco” who took Katy into the dressage show ring for the first time. Although not wanting to show initially, Katy was inspired to subsequently pursue her equine studies internationally. 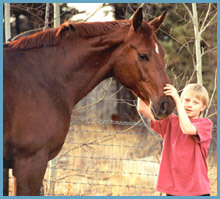 Moracco worked as a beginner school horse for both children and small adults. He was a great horse for seat lessons. Moracco passed away in 2006 at age 23 after living with us for 20 years. Incurable laminitis took the lives of brothers Moracco and Senador, also their half-sister NT Granada. Palaermo, a 1993 Westfalen gelding, was imported from Germany in 2002 where he had been trained to medium level. He became dependable enough to be ridden in a student's first show. Palaermo was quiet, sensitive and generous. He was successfully used in Little Kids' Camp. Mo died on 10/16/18. Sage was thought to be a 1985 Standardbred. He was donated to Centaur Rising by Michele White, who rescued him from a family who could not find a home for him. Michele could not keep Sage, however, because he needs a special diet and special care. Sage proved to be a useful addition to our program, safe for beginners of all ages. He was no sloutch. Sage won high-point junior/young rider horse at our 2015 Centaur Rising Dressage Show I with Avery Browne aboard. In 2017 Kris Cooper and a student, Leanne Tousey, both earned Century Club awards riding our beloved Sage. Sage passed away on 2/27/19. NT El Senador passed in 2005 away at age 22 due to untreatable laminitis caused by Cushing’s syndrome. He instilled in numerous students the passion for learning and training. Versatile in all ways, “Gumba” was a great horse for seat lessons, unsurpassed in teaching the canter. 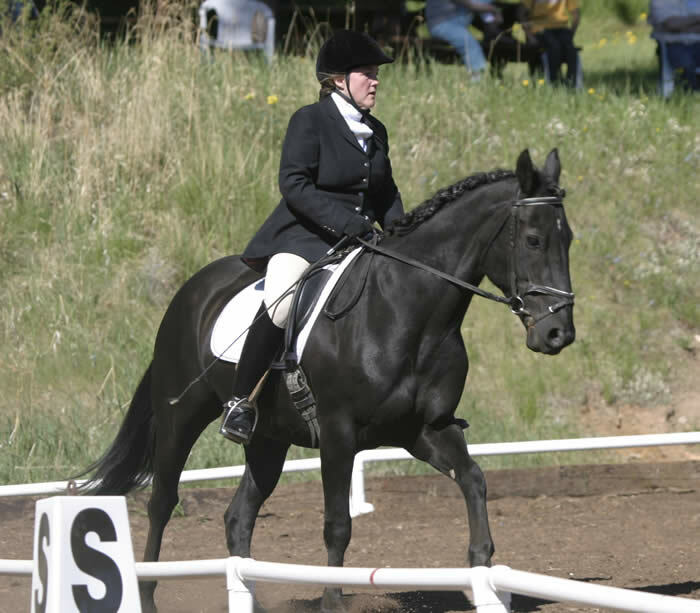 He won awards in both dressage and Arabian competition, traversed all of the first 170 miles of the Colorado Trail, and was a repeat star at the Rocky Mountain Horse Expo. Senador’s impact on adult and juvenile students cannot be over stated. A gentle, affectionate, extremely generous soul, Senador will be loved and mourned as long as humans remember him. Senador lived for 19 years at Anchorage Farm. Splash was a 1989 thoroughbred gelding who was both raced and jumped in the US before becoming acquainted with the founder in 1998. Splash was used for beginner adult and intermediate juvenile riders. 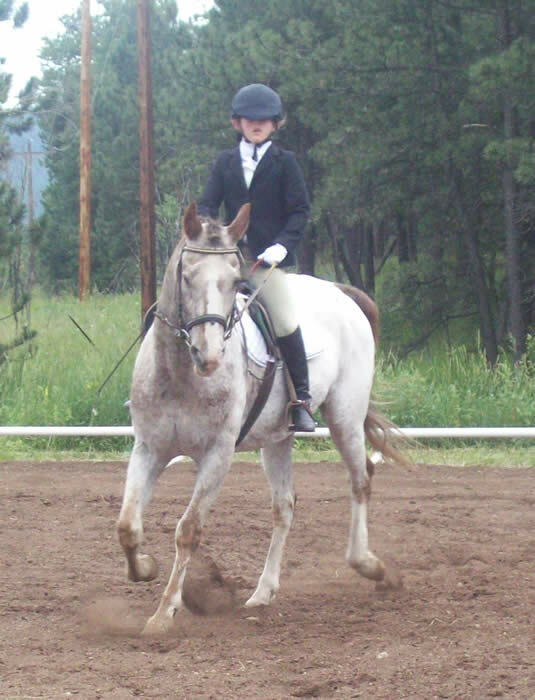 He was been shown successfully at dressage training level and was also a good trail horse. Splash was one of the school horses that launched Christina Rudman and Garion Evans (pictured on the left) into their passions for dressage. Splash taught the value of a correct warmup, a secure seat and hands that are sympathetic and not “dead” or pulling. Correct riding was rewarded with straighter more comfortable gaits. For more information about what Splash has meant to Centaur Rising's students, please click here. He passed away on January 25, 2009. “Terry”, with a registered Arabian name of ”Serros Solitaire”, was the mother of Solitaires Deckabo, “Bo”, who in 2002 won the United States Dressage Federation (USDF) national first place Pinto award, Jr/YR at training level. Bo was totally trained by our students. “Terry” was happy to pitch in at Horse Camp or for trail rides when an extra horse was needed. Terry was born in 1983, lived at Anchorage Farm for 15 years and passed away in 2007. Two Blankets (TB) had the registered Arabian name of ”Hamil Anjal”. He was our first and most durable icon. He came to Anchorage Farm in 1982 at the age of six. With no health or soundness issues, “Twobees” was, throughout his life, a testimony to correct training and riding. His “key to success” was also probably his “laid back” attitude, making him a great confidence builder for adults and children who say they are afraid of horses. Twobees made short work out of many miles of the Colorado Trail. He was a mainstay at the National Western Stock Show, at Evergreen Rodeo Parade, at the Rocky Mountain Horse Expo, at local schooling shows as well as the big Arabian shows. He was shown to second level dressage. At one point Violet Hopkins offered to buy him! Twobees won countless awards in English pleasure, country English pleasure, western pleasure, native costume and trail. He launched many students into successful show careers. Lindsay Dolan and Brooke DeVore all went into the show ring for the first time on this old gentleman. Two Blankets left our world on 8/15/07. If you remember another school horse that was near and dear to you, you may also make a donation in his/her memory. Thank you very much for the following donations in Two Blankets' name: Melanie Johnson and Scot & Amy Brunvand.